Christiana Bannister was born in the early 1820's in South County, RI, an area rich in African American and Native American history. Could her parents, Mary and Charles Babcock, have foreseen the success Christiana would achieve? That she would be an activist and entrepreneur and that her portrait would hang in museums? Yes! Despite the enactment of laws restricting women, African Americans and Native Americans, Christiana was blessed with a winning spirit. While her many contributions to her community are all around us, little is known about her personal life. From census reports, court documents and directories, we have learned that her family included Revolutionary War heroes. Christiana and her eight siblings were raised in both European and Narragansett traditions, instilled with self reliance and community commitment. By 1850, records show that all of the younger Babcock's were business leaders in Providence, Newport, Bristol, their home town of North Kingstown. Christiana most likely accompanied her brother Charles Babcock to Salem, Massachusetts, when he married Cecilia Remond. The Remonds had many successful businesses, including a wig factory and The Ladies Hair Work Salon. which Cecilia ran with her sisters. The Remonds set an example for Christiana, not only for the salon business, but also, the importance of providing jobs. The abolition of slavery required a commitment to creating jobs in the community. The Remonds were leaders in the Abolitionist Movement. The Abolitionist lecture tour featured Charles Lenox Remond, along with publisher of The Liberator, William Lloyd Garrison, and authors William Wells Brown and Frederick Douglass. Christiana met all of them through her association with the Remond family. The new technology of the day, the expansion of the railroad lines could barely keep up with Christiana. Boston and cities further a field became accessible by train. In the early 1850's, Christiana married Desiline Carteaux, and soon had her own salon on Washington Street in Boston, under the name: Madame Carteaux. She catered to Boston Society's elite. Her salons employed many new Bostonians, including the newly arrived Edward Mitchell Bannister. In 1857, by then no longer married to Mr. Carteaux, Christiana and Edward were married. He left his job as barber in the salon, and pursued his dream of becoming a fine artist. Together they were leaders in the Abolitionist community. Christiana Bannister had the honor of presenting the colors to the 54th Regiment, along with Frederick Douglass. His eldest and youngest sons, Lewis and Charles, marched that day with the 54th, and later, were amongst the survivors at the battle of Fort Wagner. The salons supported many families, and created the environment in which Edward Bannister could become a great artist. Her devoted clientele would be a life-long resource in all her endeavors. Madame Bannister addressed their minds while dressing their hair...What exactly was in the wonderful potions she created? Certainly her childhood study of herbs, bark and lichen added to her line of products. After the war, the Bannisters moved to Providence where both their careers flourished. Christiana had salons in downtown Providence, in all the right places, including Westminster Street. By 1880, Edward had become a leader of the Providence art community, and co-founded the Providence Art Club. Christiana and Edward's success afforded them a chance to enjoy the nearby RI seashore, reminding them of their youthful days. Christiana realized her dream as well, and in 1890, supported by her devoted friends and society clients, opened the Home for Aged Colored Women, in Providence, RI. The home has evolved into the Bannister House Nursing care center as it is called today. This facility was easily 30 years ahead of other groups founding hospitals and community services. Christiana's winning spirit lives on. 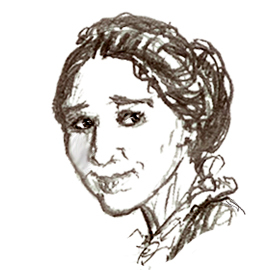 The abolition of slavery, caring for those in need, bringing joy and beauty to the world, are Christiana Babcock Carteux Bannister's legacy.